Zoe often brings the leftovers to school for lunch and I now have to pack a huge container, as all her friends want a forkful. I’ve even had some of her friends ask me if I could pack them a thermos of leftover pasta next time! This pasta is the dinner of choice at all sleepovers. You have to believe this is good if a bunch of 12 year olds are preferring a bowl of broccoli pasta to pizza! Come on, give it a try and let me know what your troops think! I love to prep all my ingredients ahead of time so they’re ready to go when needed. Wash and chop up the broccoli into small florets, zest the lemon, mince the garlic and squeeze your 1 tablespoon lemon juice; set aside in small bowls. I always put the lemon zest and minced garlic into the same bowl because they both get used together later. Get out a small glass measuring cup and add the 2 teaspoons of salt and set aside. Bring a large pot of well-salted water to a boil for the pasta. Below are two ways to cook the broccoli. Pick the one that works best for you. Steaming: Put your broccoli in a steamer over about and inch of water (or however you steam your broccoli). Put the lid on and steam away. I like to steam my broccoli while the pasta water is cooking so I get it out of the way. We like our broccoli to be a bit underdone so it has a bit of a crunch. You want to make sure not to overcook or undercook it. Once my broccoli is cooked, I pour it in a bowl and put it aside. One-pot method: Here’s my new favorite way to cook up the broccoli or baby broccoli. I toss the broccoli in for the last minute of the pasta’s cooking time. So, if the pastas cooking time is 8 minutes, I toss the chopped broccoli in at 7 minutes, and then drain the pasta and broccoli together. NOTE: If one minute seems too short then throw it in for the last two minutes. One minute definitely works for baby broccoli and broccolini. Meanwhile, while the pasta is cooking, melt 2 tablespoons butter and 2 tablespoons olive oil in a small sauté pan over medium low heat. Once the butter has melted, add the garlic and lemon zest and cook for about 1 minute, until fragrant. 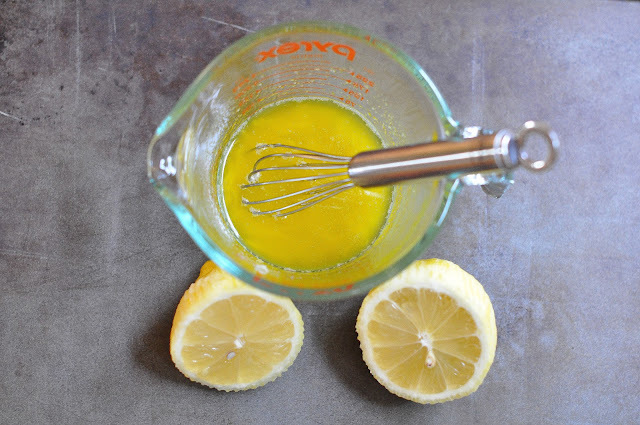 Pour this mixture into the glass measuring cup (the one the salt is in) and then add in the tablespoon of lemon juice, mix the ingredients together. Once your pasta is cooked, drain it and add it to the bowl that the broccoli is in, if you steamed your broccoli, or if you cooked the pasta with the broccoli, then put the drained pasta and broccoli back into the pan you cooked it in. Add the lemon mixture and toss everything together really well, so all the pasta and broccoli are coated with the lemon mixture. I top each bowl of pasta off with some freshly shredded parmesan cheese, a few swigs of freshly ground pepper and toasted pine nuts/walnuts. The pepper adds a bit of flavor and the nuts add a nice nutty and meaty crunch. The kids rate this dish a 10! The broccoli tastes amazing as the lemon gives it such a nice flavor and takes away any bitterness. I can honestly say that I’m not the biggest broccoli fan when it’s just steamed, but I can eat a whole bowl of broccoli when its made this way. You might even want to make this lemon sauce and just add it to a mess of broccoli one night. I hope this pasta becomes a family favorite in your house. Here’s some other easy family favorite pastas to try! Pasta with pesto and broccolini. Spaghetti with cheesy broiled tomatoes and basil. Pasta with lemon, kale and toasted walnuts. Green bean and shallot ravioli. This is an easy, weeknight, meatless, family friendly, 30-minute, one-bowl pasta dish that gets requested weekly at my house. This is the pasta that got my kids to first TRY and LOVE broccoli. Prep all of your ingredients. Wash and chop up the broccoli into small florets, zest the lemon, mince the garlic and squeeze your 1 tablespoon lemon juice; set aside in small bowls. I always put the lemon zest and minced garlic into the same bowl because they both get used together later. Get out a small glass measuring cup and add the 2 teaspoons of salt and set aside. Below are two ways to cook the broccoli. Pick the one that works best for you. One-pan method: Here's my new favorite way to cook up the broccoli or baby broccoli. I toss the broccoli in for the last minute of the pasta's cooking time. So, if the pastas cooking time is 8 minutes, I toss the chopped broccoli in at 7 minutes, and then drain the pasta and broccoli together. NOTE: If one minute seems too short then throw it in for the last two minutes. One minute definitely works for baby broccoli and broccolini. 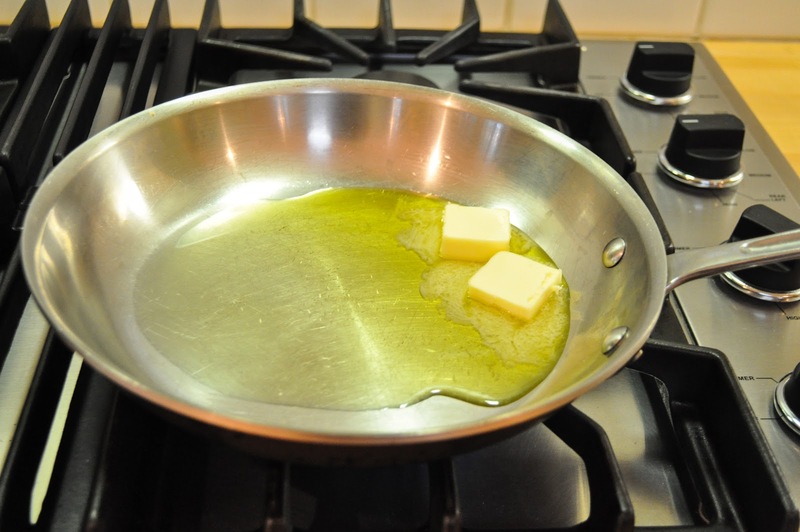 Meanwhile, while the pasta is cooking, melt 2 tablespoons butter and 2 tablespoons olive oil in a small sauté pan over medium low heat. Once the butter has melted, add the garlic and lemon zest and cook for about 1 minute, until fragrant. 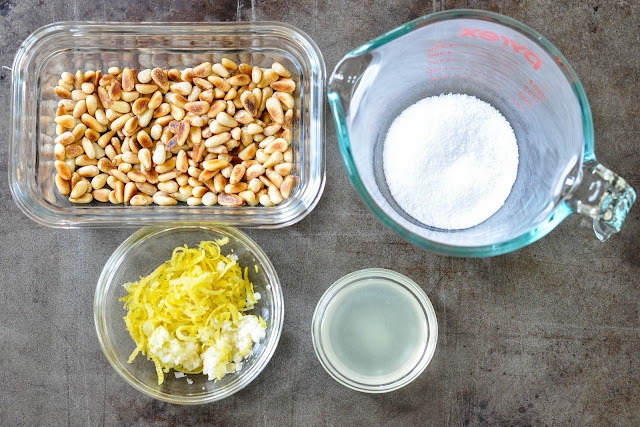 Pour the butter/garlic mixture into the glass measuring cup (the one the salt is in) and then add in the tablespoon of lemon juice, mix the ingredients together. Once your pasta is cooked, drain it and add it to the bowl that the broccoli is in, if you steamed your broccoli, or if you cooked the pasta with the broccoli, then put the drained pasta and broccoli back into the pan you cooked it in. 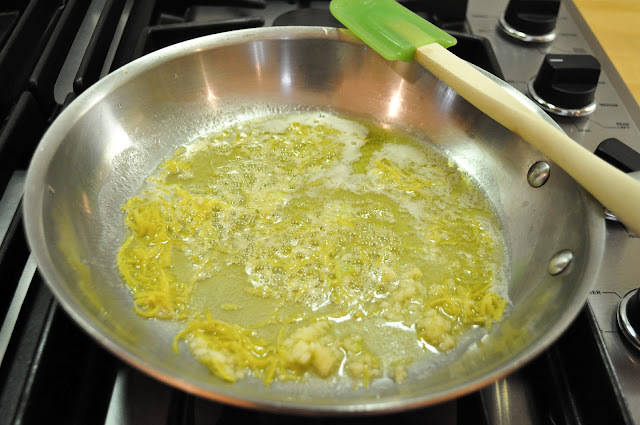 Add the lemon mixture to the pasta, and toss everything together really well, so that all the pasta and broccoli are coated with the lemon mixture. Serve the pasta up into individual bowls. I make sure that each bowl gets a good amount of broccoli and then I add the pasta. I top each bowl of pasta off with some freshly shredded parmesan cheese, a few swigs of freshly ground pepper and toasted pine nuts. The pepper adds a bit of flavor and the pine nuts add a nice nutty and meaty crunch. « Kale & Spinach Smoothie! Yummy! I’ve made this a couple of times now and my kids (3 and 5) always ask for more! I just tried it with broccolini and baby broccoli and I love the different flavor it gives as opposed to regular broccoli. My kids ate up their plates! Thanks for this great recipe! Super yum! Just made this and my 4 yr old loved it, even the pine nuts! My 1 yr old ate all of it too, though she picked around the broc, that’s cool she’s still developing her eating habits 😉 Bonus, ny husband came home late and ate it cold and thought it was great too! Winner! Hi Jackie – I have two boys who can’t have pine nuts, or any nuts for that matter. What would you suggest I could use to substitute them for that extra something? Made this tonight — I had all ingredients on hand! Very tasty… My two little ones devoured the pasta, and the one who eats broccoli ate that too. Thanks for sharing another tasty recipe! Where have you been all my life!? Another FANTASTIC recipe this one may be my favorite! Even my 15th old is crazy about it. You have a wonderful weekend Jackie!!!!! I am going to try this recipe today.. Pics looking stunning..
Alright! Am eating this right now and could not wait to tell you that I am a huge fan! We’ve been cooking from your blog all week and tried (and really enjoyed) your turkey burger recipe last night. Thank you for sharing your delicious eats! BTW, my kids are 8 (will eat anything) and 5 (pickiest eater ever). And they loved the broccoli. Hi Robin! Thanks for stopping by and giving this pasta a try. I’m so glad your kids loved it. 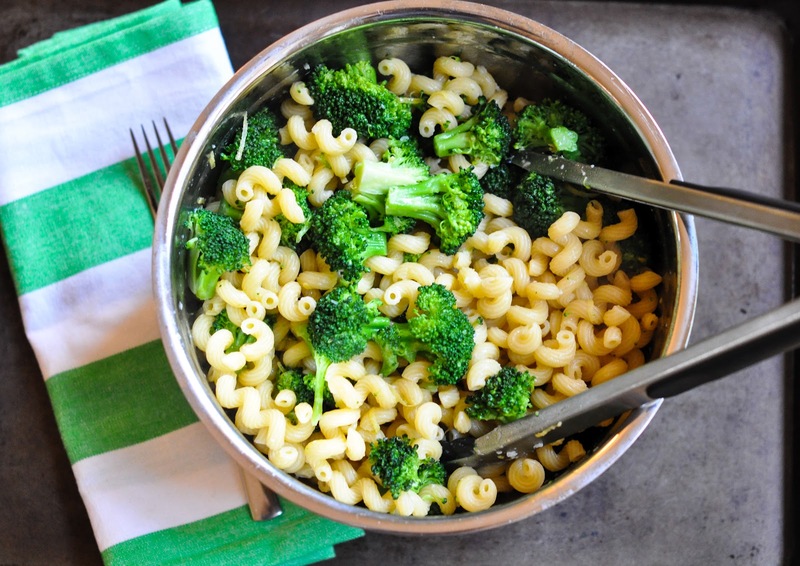 I’m not a big broccoli fan on its own, but throw it in this pasta, and I’m hooked. My kids feel the same way and this was the dish that got my son to start eating broccoli. Gotta love that Barefoot! Made this for our family tonight. Delicious and definitely kid approved by my 7 and 5 year old!! I’m going to try this one too. Marin Momma Cooks rocks!